Looking for unique German Shorthaired Pointer Gifts? We have beautiful handmade gifts, including German Shorthaired Pointer mugs, wine stoppers, creamers, sugar bowls, dipping bowls, treat jars and more. 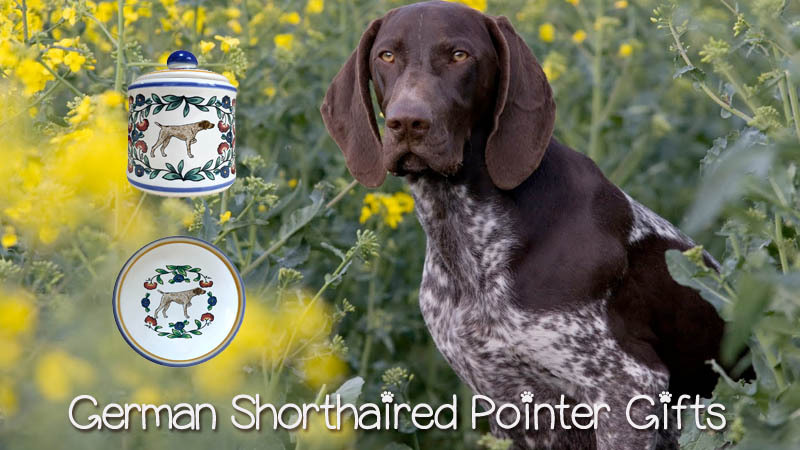 All of our German Shorthaired Pointer merchandise is handmade for you in small batches in our northern California studio - made with love and made in America. And our stoneware is worry free because it is durable and decorated with non-toxic, food safe decoration and glaze. So, you can feel free to use your German Shorthaired Pointer gifts daily, and dishwash and microwave them to your heart's content. Our German Shorthaired Pointer gifts featuer a GSP, surrounded by a colorful floral pattern, with cobalt blue and golden yellow accents. We currently offer one coat variation but you can customize your items to reflect your German Shorthaired Pointer's colors and markings using the "custom" option in the drop down menu (a small $8 art fee will be applied to all custom work). German Shorthaired Pointer's are very popular here in the US, receiving a ranking of 11 by the American Kennel Club. They have a wonderful aristocratic look about them, are clever and very athletic. They are primariy bred to be hunting dogs and thus do very well in field trials. Their energy and problem solving abilities make this breed well suited to agility too. On top of everything else, they love their people, and that's the best part. Our neighbor's GSP is so devoted to them, and at 12 years, she's as active as a pup. We are sure you will find the perfect German Shorthaired Pointer Gift for that someone special.